Tristan 'rff'd at his mistress' feet. She was taking far too long getting the meat he was trying to devour though telekinesis; as though it would be his simply by staring at it hard enough. Both the proprietor and Akaichou laughed at the Papillon's vocal impatience. "Very well, it's for a good cause." the salesman agreed on the price for the dog's meal, unable to overcharge that face. Akaichou smiled and finished the exchange and inclined her head. "I thank you. Please be assured you can count on my returning business." She turned to leave, light lavender dress twirling around her feet. She took a few steps into the street before bending to give Tristan a bit of the meet he'd been envying from below. Glancing upward, she thought she saw a familiar face. Was that the Rokugani girl from yesterday? Standing in the middle of the street was the rokugani magistrate. Hands on her hips. 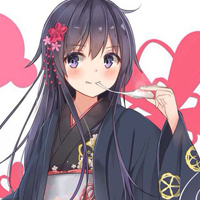 Hikari was wearing her yukata; it was super-fancy... or at least it had been at one time. It had gotten soaked with sea-water a few days ago, and so it had lost some of its lustre. Still, it was not hard to tell, even if one was unfamiliar with Rokugani fashion, that it had cost a great deal of money. "No, no, this won't do. I think we took a wrong turn somewhere." Hinami tag along her sister in her quest to find a good place to stay. She was wearing her white yukata since the tropical heat was pretty intense. The Sepppun courtier looked around with suspicion and quite a bit of culture shock, as they were surrounded by strange and savage gaijin. She fanned herself to keep her cool and to cover her mouth. '' Are you sure this is a good place for you? I mean look around...'' Hinami was really shocked by the scene '' You should come with me to the Westport...'' She said. "Hey, I could make it here." She took out a piece of candy, because ofcourse she did. She had a seemingly endless supply of them, after all. "But you're right," she started nibbling at the candy, letting it last for as long as possible. "It doesn't really scream me, does it?" Akaichou saw the girls talking and hesitated to approach, but Tristan had finished and she wiped her hands on the cloth she kept with her for such purposes. She didn't wish to have her hands smelling of meat all day. Yes, it was definitely Seppun Hikari. She looked infinitely better rested and refreshed than she did yesterday. Still, Akaichou felt the need to check. She approached the duo and bowed. "Seppun-san. You look well. I hope you have been well treated." "Oh," she said, turning her head to the woman. "Ide-san," she said, careful to not mangle the name. A small bow of the head, and then she looked toward her sister. "This is the one I told you about," she said and then turned back to the unicorn. "This is my twin sister, Seppun Hinami." The two were not identical, but the family resemblance would certainly be there. Akaichou bowed again. "Seppun-san, it is a pleasure to meet you. How are you both faring after the events of yesterday? I hope your things were found." Tristan was sniffing around their shoes. "Tristan, no. Leave them be." She smiled. "I'm sorry. Tristan can be curious." It was probably a good thing Azuki was not here. "It's alright," she said, leaning down to pet the creature. "Most of our stuff seemed intact. Some broken things, some damaged things." And she stood back up. "At least the important stuff is in good condition." But her name, Ide. That really caught Hinami's curiosity. Ide was one of Shinjo-no-kami followers, if she remembers correctly, he was the husband of lady Otaku, the Ki-rin's Thunder.
'' It is an honor to finally meet you, Ide-san. I hope that you had Inari's-no-kami blessing today. '' She slightly bowed to the gaijin. '' First, let me give my thanks for taking care of my sister yesterday. She told me how you helped her. Arigato.'' She said sincerely. Akaichou inclined her head toward Hinami before making eye contact with Hikari and smiling. "I only wish I could have done more. I don't know much about medicine. I'm happy to see you now. I remember wanting to discuss one another's histories. In fact, I would show you something if you would like. I have never shown someone before, but as a Rokugani, only you would understand the significance." She breathed. "Unless of course I have interrupted. Please correct me if I do or say anything offensive. I think customs must have changed over time." "No, I could use the break. And I do want to discuss histories and such yes. I'm sure you must have many questions about us and Rokugan as well." "I do." Her violet eyes sparkled. "While the Ide kept what records we could of Rokugan, over time things are lost. I look forward to real details." Well at least she has some manners, still her clothes... Hinami thought as she listened to the gaijin woman.
'' Sure, Ide-san, I suppose we all are eager to understand how is that you ended up here, you claim to be a descendant of the lost Ki-rin clan if my sister heard you right. '' 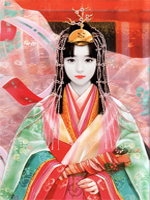 She said clearly still not convinced that the noble Ki-rin clan of kami Shinjo could be around here. She nodded. "Going over the entirety of the history would be quite a lengthy exposition. It would be best if you ask specific questions as a starting point." She then nodded toward her sister. "And my sister's curiosity is shared by myself. Many within Rokugan may not even believe the Ki-Rin more than myth." The Emissary didn't flinch at the sisters' doubt. As an Ide she'd been taught extensively that others will undoubtedly be suspicious of one's intentions. It did seem in a way kismet that they should meet in such a way. "I understand. It has been many, many years, after all. I hope what I would show you could help. If you would follow me, I have a place we could speak more comfortably. I am staying with family friends. They live above the... Forgive me, I don't know the translation. They sell medicine and help people heal. It's just up the street in a quieter area." Tristan circled the 3 of them, sitting with a small 'woof' of interest. Akaichou smiled down at him suddenly thinking how he provided her safety, even just a tiny feeling. He really couldn't harm a mouse if he tried. "I would, of course, understand if you feel you need a guard." Definitely Hinami would prefer to go with a yojimbo. She didn't know anything about this strange woman, nor about her 'family friends'. From what Hinami heard, these savages had a slave market where they sold 'people' like cattle. Slavery was a strange and blasphemous concept for Hinami because, at the very least, heimin had some rights and they were part of the celestial order. But Hikari was an Jade Magistrate, if things turn ugly, she could burn these barbarians with just one prayer to the kami. '' Since my sister is a Jade magistrate I will leave that decision to her.'' She said. She wasn't sure how being a Jade magistrate applied in this situation, and she didn't exactly share Hinami's confidence that she could burn everyone here with a simple prayer, but she also didn't see the harm in following the woman. She appeared honest enough, and nothing was ever gained by not taking risks. "That won't be necessary," she told the unicorn. "Please lead on." A boy, maybe twelve, pushed his way through the crowd beside them. Somewhere on the roofs on surrounding the Hoof, a cat was lounging, observing the traffic below. Two tasty pigeons after, Mr. Cuddles could finally enjoy the sunny day.